A 1966 ban on development in a disputed tribal area left many Navajo living in third-world conditions -- or forced them out entirely. When the freeze ended, many residents didn't know where to begin. CAMERON, ARIZ.--This is the land where Larry Gordy was destined to live, until it was made unlivable. The Navajo believe that a person will always be tied to the place where his or her umbilical cord is buried. When Gordy was born in 1968, his father put his in this rust-colored dirt. It was here on the family's ranch on the edge of the Painted Desert that his father dreamed of one day building homes for his children, and of tilling a field where watermelon and corn could grow. But the Gordys were forced to put their dreams on hold. In 1966, the commissioner of Indian Affairs, halted development on 1.6 million acres of tribal land in northeastern that was claimed by both the Navajo nation and the Hopi tribe. Bennett imposed the ban to stop either tribe from taking advantage of the other while they negotiated ownership. The ban became known as the Bennett Freeze. It meant the Gordys and the 8,000 or so other Navajos living on the land couldn't erect homes, open businesses or even repair their roofs. No roads or schools were built, no electric, gas or water lines were permitted. The land dispute dragged on for 40 years, paralyzing residents in a state of poverty rarely seen in America. Because few Hopis lived on the disputed territory, the ban affected mostly Navajos like the Gordys, who deserted their ranch after it fell into disrepair. The tribes settled their differences in 2006 -- most of the land went to the Navajo -- and in May (2009), President Obama cleared the way for federal funding to help rehabilitate the area, but no money has been earmarked yet. Navajo officials hope some money may come their way. But as politicians grapple with how to spend any funds, the people face a question of their own: Is it possible to make up for 40 years of nothing? Gordy is now 41, with a wife and four children. They live in a drafty trailer in the town of Cameron, a 30-minute drive from the old ranch. Cameron was also under the Freeze, but in town, at least, the family could string an extension cord from a neighbor's house to get electricity, and draw water from a working well a few miles down the highway. Though it is now free to do so, the family has not made improvements to the trailer. The cash Gordy makes selling firewood, and the money his wife earns selling jewelry to tourists at the Grand Canyon, an hour away, isn't enough. As often as he can, Gordy brings his children to the ranch, which is scattered with rotting buildings, dirt-caked appliances and rusty car parts, to teach them about their heritage and about the land they were forced to leave. But he isn't sure where to begin. If it wasn't for the Bennett Freeze, we would have a place to live," said Gordy, a large man with a patchy black beard and an amiable manner. "But now we just have a junk pile out here. Now that the freeze is lifted, we're expected to come out here and build something out of all this junk. Well, with what? It'd be like if a rancher penned up a bunch of sheep for 40 years and then all of a sudden one day he opened the fence and let them loose. They wouldn't know what to do. And neither do we." The Navajo nation, whose territory sprawls 27,000 square miles across three states, is America's largest tribe, and one of its poorest and most isolated. The tribe only recently opened its first casino, and unemployment hovers about 50%. 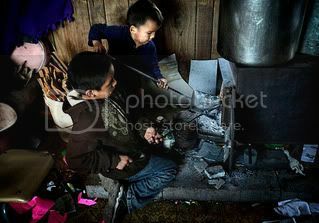 Many people still live without electricity and plumbing. But even by Navajo standards, the conditions in the former Bennett Freeze region are astonishing. and bathes the next in line until everyone is clean. 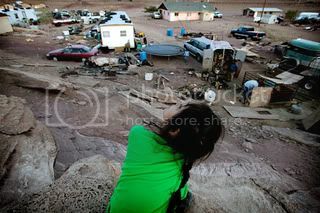 A study commissioned by the Navajo found that only 24% of the houses in the area are habitable. Most homes lack plumbing, and while a third of the residents haul in potable water, others resort to drinking from the same wells as their livestock -- water that in some cases is contaminated with bacteria or uranium. Nearly 60% of houses lack electricity, even as steel power lines strung across the land buzz with the energy they carry from the Navajo Generating Station in Page, Ariz., south to Phoenix and west to Los Angeles. But on a recent afternoon, on a high, dust-blown plain known as Black Falls, the sounds of promise rang out from a rooftop. Two men, sweating in the sun, had spent all day on top of Mary and John Knight's 47-year-old cinder-block home, hammering down a tarp to protect the roof from the elements. It was a simple act that had been illegal for nearly half a century. When the freeze was lifted, a local community organizing group informed the Knights that they were now eligible for money from federal programs. They secured roofing materials from a weatherization program and called over some friends to help install it. As a gesture of thanks to the workers, they planned to slaughter a sheep to make mutton stew. The Knights had tried to fix the roof twice before. Rangers from the Hopi tribe came by each time and told them to stop. The tribes have been rivals since the 1500s, when the nomadic Navajo arrived on the Hopi-occupied Plateau, a stretch of high-altitude desert where Arizona, Colorado and New Mexico now meet. The conflict over land rights began in 1934, when Congress set aside a large tract in Arizona for "the Navajo and such other Indians as may already be located thereon." The land was populated mostly by Navajos, but the Hopis laid claim to the area because a Hopi village, Moenkopi, was located in its midst. In 1966, while the tribes negotiated ownership, Bennett imposed the development ban. Moenkopi and the Navajo town of Tuba City were exempt. But residents of Bennett Freeze lands lived under continuous monitoring. "Our parents felt like they had to hide and sneak around," Gordy said. "If you tried to do an addition, the Hopi would pay you a visit and say, 'Hey, there's no agreement yet.' "
Some people found ways to evade the freeze by building horse corals slowly, post by post, to avoid attracting attention from Hopi rangers who circled overhead in helicopters. Others camouflaged improvements by remodeling only the inside of their homes. Gordy's family stored the hay for their horses in a junked bus and built their corral on the side of a sandstone rock, where it was somewhat hidden. But they couldn't hook up to water or electricity. Eventually the hardship drove them out. Many, including Katherine Peshlakai and her daughter, Eleanor, stayed. The Peshlakais live about an hour's drive from Gordy's ranch in a neatly kept house atop a wind-swept hill beneath the vast Arizona sky. From their home they can see hundreds of miles in all directions, from the burnt-orange mesas in the east to the San Francisco Peaks -- one of the Navajo's four sacred mountain ranges -- in the west. Both tie their silver hair back in buns and walk with the help of canes. "Our children and our grandchildren is why we stay," said Katherine Peshlakai, who is in her 80s. Since the freeze was lifted, the Peshlakais' home has been outfitted with a solar panel and a small wind-power generator, which they rent for $25 a month from their tribal chapter. They say they are also in line to receive a water sanitation system that would include bathroom fixtures from the Indian Health Service. But they complain that the aid extended so far from the Navajo nation and the federal government has only come from the top down. "They don't want to hear our suggestions," Peshlakai said. "They don't want to work with us." Many people who lived through the Bennett Freeze say they have little faith in the federal government and complain that the tribal government should have done more to get the freeze lifted. "What really makes me sad is when the tribe gives up on its own people," said Vera Redell Bennett, 52, who was told that she could not move onto a plot of land near her mother's home on the outskirts of Tuba City because it was on the freeze. Paralyzed from the waist down since age 18, when she was shot by her ex-boyfriend, Bennett has lived inside her van for the last six years. She parks it in an empty lot in Tuba City. It's cold in the winter, she said, and she often doesn't have enough gas to keep the heater running. But at least she has a bed, piles of blankets and her little dog, Missy. Every day a caretaker provided by the state brings her food and empties the jugs that she relieves herself in. Bennett has resigned herself to her disability, but not her third-world living conditions. "People who don't live on the reservation don't live like this," she said. "I shouldn't be living like this." since their father's recent death. The development freeze was hardest on the sick, said Nina Tohannie, 50, who works for the Indian Health Service. She said substandard living conditions had led to a number of health problems, including an epidemic of upper respiratory problems linked to badly ventilated stoves. And life without electricity meant that sick people were unable to refrigerate their medicines. That was one of the reasons Gordy's father, who, like many Navajo, suffered from diabetes, left his ranch. He died in 1995 from complications of the disease. Roman Bitsuie, a Navajo official who is working with Arizona Sen. John McCain office to craft legislation to infuse money into the Bennett Freeze area, said it might be impossible to repay people for damage done to their physical and psychological health. "How do you compensate for someone's spiritual scars?" he asked. "I don't think there's a price on that." Bitsuie said he did not know how much money might be included in the bill, which could be introduced later this year, or how it would be distributed. Don Yellowman, the president of Forgotten People, a Navajo community organizing group that is one of the only groups doing work in the former Bennett Freeze region, said that redevelopment money should not go through the Navajo government but through federal agencies such as the Department of Transportation or the Department of Housing and Urban Development. The people don't trust the tribal government to handle rehabilitation, he said, because of a history of corruption -- the Navajo president was recently put on leave while he and other top officials are investigated for fraud -- and because they feel let down. "There was no real public education about what people were enduring," he said. Some people, like Denise Almeida, who lives not far from central Tuba City, don't even know whether they were living under the freeze. All Almeida knows is that she was unable to get aid when her trailer burned down last year. 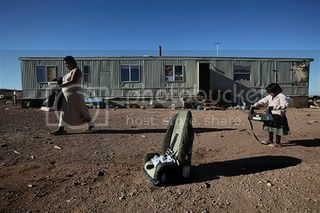 She and six of her children now live in a sagging travel trailer without water or electricity. People carry on; if there was one thing Larry Gordy learned while living through the Bennett Freeze, it was that. Even though he no longer lives on the ranch, he still keeps a few horses there. When his children were born, he buried their umbilical cords in the corral. Now that the freeze is lifted, Gordy hopes to rebuild and move his family back onto the land. Next March, he said, he will start by tilling a field. The kids want to grow pumpkins. And he'd like to try his hand at watermelon and corn.